The Garden is a unique and special venue that is available for private events including parties, celebrations, courses, workshops, play groups, training days and demonstrations. Some of these are one-off and others are regular bookings. When you book the Garden you have use of all the facilities including the large octagonal cabin, with a wood burning stove, which seats forty, a bonfire and barbeque area, a covered area with a basic kitchen, table and chairs, a wood fired bread oven, cob oven and tandoor oven, and sandpit. The Garden is fully accessible if you are using a wheelchair or have limited mobility and safe if you have small children. There is a fully accessible composting toilet. Because the Garden is run by volunteers and there is no caretaker or staff, each person using the Garden has to take responsibility for it. Please read the ‘Guide to booking and using the garden’ which need to be understood and agreed to when making a booking. In particular there is a strict policy of no alcohol or drugs. 1. Read the ‘Guide to booking and using the garden’ to see if the Garden is the right venue for your event. If you are still unsure please contact us for more information. 2. Look on our online calendar to see if the date you want is free. 3. Email or phone us to confirm the date and times and make a provisional booking to reserve your dates. 4. Complete the Booking Contract and send it to us with your donation. Details for payment are given on the contract. If you still can’t find what you are looking for there is additional information in our Frequently Asked Questions. If you need any further assistance please contact us. 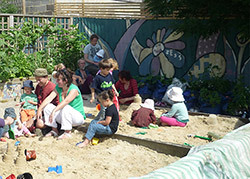 Barracks Lane Community Garden is a small charity run by the community for the community. Donations for the use of the Garden are vital to its survival. We ask people to make a minimum donation of £12.50 per hour for private use of the Garden and more if possible. There are some extra costs if you want to use logs, firewood, gas or electricity. More details about these donations are in the ‘Guide to booking and using the garden’.